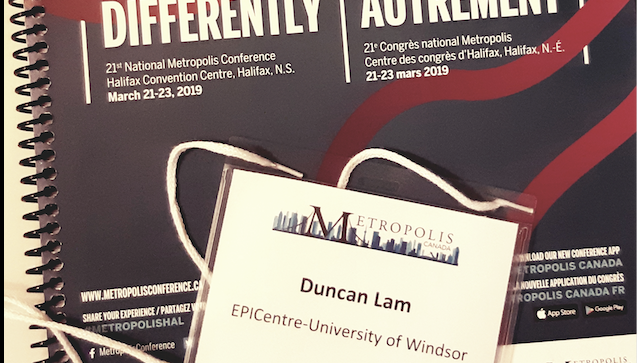 Duncan Lam, EPICentre UWindsor Research Assistant, will have the opportunity to present his research “It Takes a Village: Building Resilience by Connecting International Students to the Broader Community” at the 21st National Metropolis Conference in Halifax, NS on March 22, 2019. I am honoured to be given the opportunity to represent EPICentre and the University of Windsor to give a presentation of our research-in-progress entitled It Takes a Village: Building Resilience by Connecting International Students to the Broader Community at the 21st National Metropolis Conference in Halifax, NS on March 22, 2019. The title of the conference this year was Doing Immigration Differently, and that is exactly what our research, in partnership with the Building Migrant Resiliency in Cities project, is trying to achieve. The feedback received from attendees will definitely make our research more robust. Thank you EPICentre, the University of Windsor, and the BMRC partnership for giving me this wonderful opportunity to share our research.